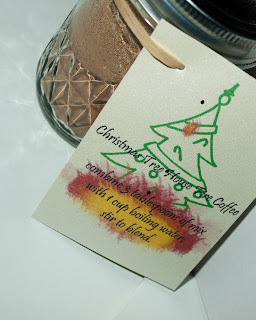 This coffee was designed with the crafting of my "naughty" gifts. My husband named it, I thought it was hilarious and had to use it. It is actually a bavarian coffee, which is often used with mint of some sort. Making the coffee was very easy. Then, using a canning funnel, pour the mix into a canning jar, tapping the jar on the table to settle it a bit. Then, decorate the jar however you like, with a square of fabric, a piece of ribbon, sticker, tag, whatever that you like. Make sure you include the directions on how to serve a cup!